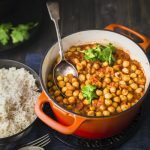 This 30 Minutes One pot Chana Masala is a wholesome flavoursome and healthy Curry served with Rice, Roti or Naan Bread. Heat oil in a deep pan , add Cumin Seeds. Once they splutter add Ginger- Garlic Paste, Slit green chillies & onions. Sauté them for a few minutes until raw smell is eliminated. Adding a pinch of salt to onions evaporates the water content quickly. Now add a can of diced tomatoes, turmeric powder, chilli powder and sauté them until it mixes well with the onion mixture and the oil begins to separate. Blend this mixture well in a blender after cooling down if you like the texture smooth. But if you don’t mind it a bit chunky, continue cooking. Add coriander powder, garam masala, salt, chickpeas and 11/2 cup of water. Stir well and allow this mixture to cook for at least 10 minutes until desired consistency is achieved. Check for seasoning and spices and add more if needed. Serve this easy Chana Masala with Uncle Ben’s Long Grain Rice.